This week we’ve gone from consuming 5 course dinners every night in a lovely hotel on holiday in Wales, to thinking about weight and the brain. It’s sweetly ironic and rather timely. As part of our mini series on health and wellbeing, this week we think about weight and if we can use our brains to help us lose weight. Today’s featured author certainly thinks so as Dr Daniel G. Amen devotes the second section of his book, ‘Change your Brain, Change your Body‘, to the subject. Last week we looked at 10 brain principles for the body you’ve always wanted. Continuing with our exploration of the link between your brain and body and how having a healthy body and making healthy decisions all starts with your brain, we turn to the subject of weight. Weight is an aspect of our bodies that many of us want to do something about. We might want to change our weight upwards or more commonly downwards, for our health and because we think it will make us feel better about ourselves. So what does Dr Daniel G. Amen say about this? 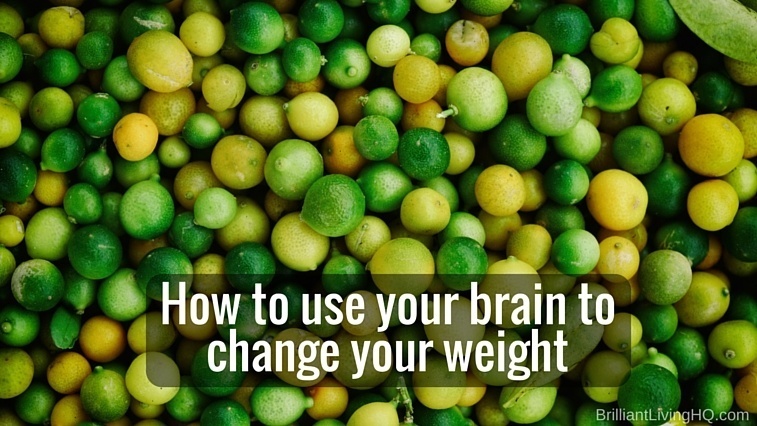 How can you use your brain to achieve lasting weight loss? Dr Amen, puts forward four major solutions to how to use your brain to change your weight. This is about using your brain to increase your willpower and calm the urges that prevent you achieving your goals. How often do we have a day where everything’s going well and then someone offers us a cream cake? In Dr Amen’s case it was a caramel apple which he resisted it by walking away – but why was everything in him craving it? Essentially, there are centres of the brain responsible for focus, judgment and impulse control – the pre-frontal cortex in the front of your brain – and there is also a pleasure and motivation centre deep within your brain plus we also have emotional memory centres that trigger behaviour. All this comes together to influence our behaviour. By understanding these brain circuits of willpower and control you can work towards gaining mastery of your brain and body. It starts with our first experiences of pleasure or intense emotional experiences. These first experiences can get locked in the brain and lay down the tracks for later behaviour and addictions, because we want to replicate and repeat what led to our first pleasurable experiences. For Dr Amen it was linked to the pleasure he associated with some of his earliest memories of making fudge with his sweet-maker grandfather. What about you? What are your earliest memories of pleasure or intense emotional experiences? I remember eating ‘milky way’ chocolate bars at my Grandma’s house when I got home from school and my Mother’s sherry trifles were legendry at family parties and celebrations of every kind. For Julian the stodgy puddings of school dinners and getting enough of it after it had been passed down the table of older children first, loom large in his memory (yes he is that person that loved school dinners)! So going back to the idea there are different centres of the brain responsible for focus, judgment and impulse control plus a pleasure and motivation centre, it’s the relative strength and weakness of each of these brain areas that goes a long way in determining how much control we have over ourselves and how well we are able to stick to our plans. Here, you’re using your brain to achieve your optimal weight. While according to Dr Amen we might exhibit different clinical presentations and brain patterns and require different approaches, he outlines 13 things all of us should do to maintain a healthy weight. Know your BMI and caloric need numbers – the approximate number of calories you need to maintain your current weight. He gives you a formula which you can use to calculate the number of calories you need to maintain your current weight. Know the approximate number of calories you eat a day by keeping a food journal and calorie log and work on getting ‘high-quality calories in versus high-quality energy out’. This is useful because people lie about their food intake, or to put it more kindly, we often underestimate our daily intake and keeping a food journal overcomes this tendency. You start using your brain to become educated about the nutrition you put in your body and can then take control over it. You can not change what you can not measure. Exercise 4-5 times a week, starting with walking fast and light strength training. This involves feeding your brain nutritious foods to look and feel younger, on the basis that we are what we eat, and that the foods we eat affect our moods and our energy levels. We’re constantly getting the wrong or unhelpful messages about food. As a society we’re bombarded with messages encouraging us to adopt bad eating habits. ‘Do you want to supersize that?’, ‘Do you want bread first?’ ‘Do you want a larger drink? It’s a better deal’, the All you can eat buffet! Many of us send out the wrong messages to our children ‘If you’re good, you can have a treat when you get home.’ We use poor nutrition as a reward for good behaviour which later in life translates to us rewarding ourselves with food that is not good for us. Increase good fats (unsaturated fats) and decrease bad ones (saturated and trans fats) Unsaturated good fats include: avocadoes (thought you’d like that one), olive oil, rapeseed oil, peanut oil and nuts such as almonds, cashews and pistachios. Dump artificial sweeteners and replace with small amounts of natural sweeteners. Limit caffeine intake to one or two normal cups of coffee or three cups of tea a day. Plan snacks. Interestingly, he says don’t listen to the idea of avoid snacking. Going too long without eating can wreak havoc on your brain function and make your blood sugar levels drop too low. But make them healthy snacks. Recognise when you or someone you care about has hidden food allergies. Exercise your body to strengthen your brain. We’re becoming more sedentary – driving to work, sitting all day at a desk, lounging on the sofa. This is bad news for our brains, our bellies, our backsides and our backs. Is this something you’d like to change – sign up for our free Changeability Starter Kit. Take our survey. It’s super quick and easy.